18th July 2018, New Delhi: For Parliament, 2017 was a mixed year. The disruption of proceedings continued to weaken the working in both Houses of Parliament. This year’s budget session of the India Parliament was one of the least productive in the last 15 years. The session saw utilisation of just 1% of its allotted time in Lok Sabha and 6% in the Rajya Sabha. The Prime Minister had expressed his agony towards the opposition for clogging the working of the parliament. The upcoming Monsoon Session of the Parliament, which will begin on 18 July needs to addressing six ordinances along with the 68 pending Bills in Lok Sabha and 40 in Rajya Sabha. 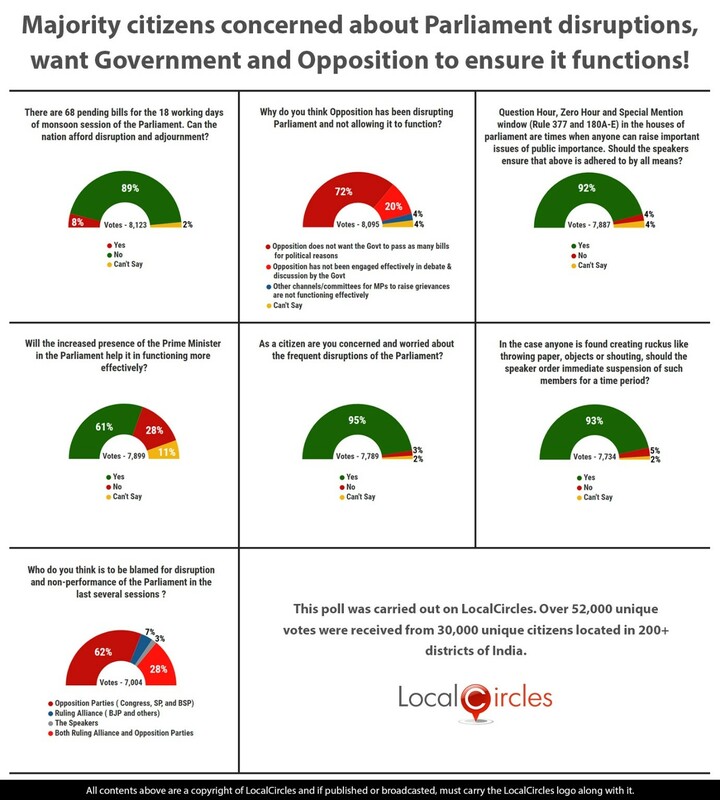 LocalCircles conducted a large study to ascertain how people want the parliament to function in the upcoming session. There are 68 pending bills for the 18 working days of monsoon session of the Parliament. The first question asked if the nation afford disruption and adjournment? 89% said that we cannot afford disruptions while 8% said disruptions were okay. Second question asked citizens why the opposition has been disrupting Parliament and not allowing it to function. 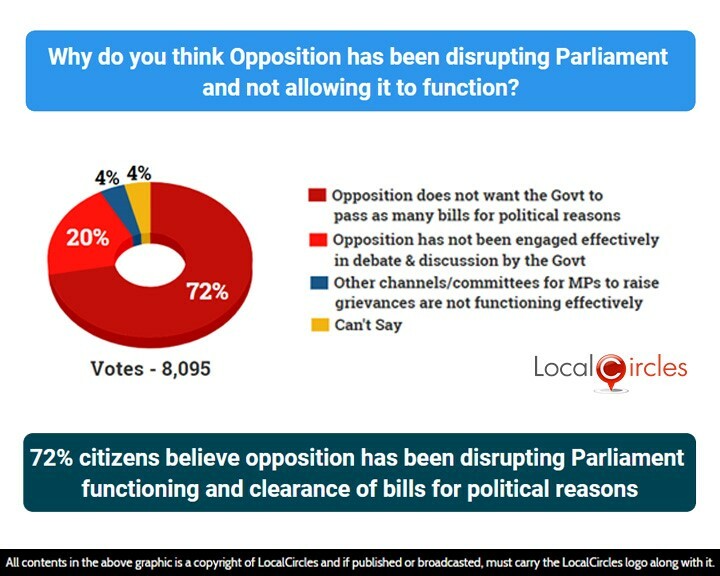 72% said opposition does not want the government to pass as many bills for political reasons, while 20% said opposition has not been engaged effectively in debate & discussions by the government. 4% said other channels/committees for MPs to raise grievances are not functioning effectively, and another 4% were unsure. 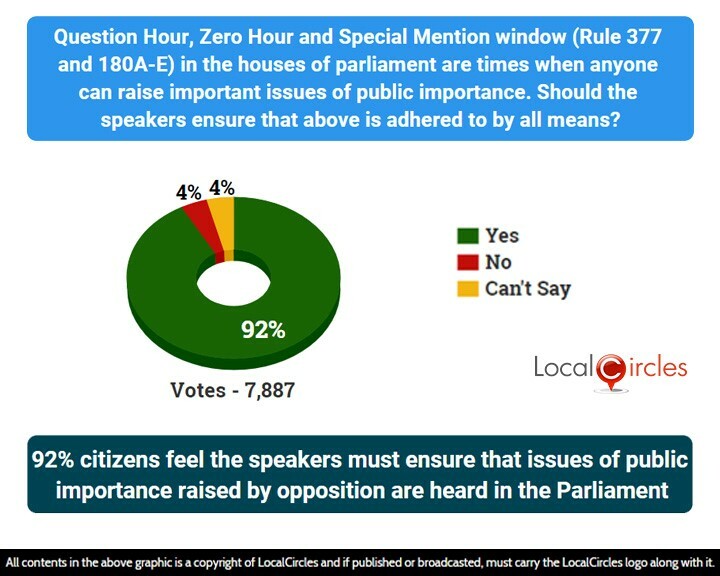 IQuestion Hour, Zero Hour and Special Mention window (Rules 377 and 180A-E) in the house of parliament are times when anyone can raise issues of public importance. The following question asked if the speaker should ensure that above is adhered to by all means. 92% respondents agreed with it while 4% did not agree with it. Many bills in the last few years have been passed by the government without any discussion in the Parliament. This has caused the opposition to feel redundant and as a show of discontent, they resort to disrupting proceedings. Senior Congress MP Jairam Ramesh paid a courtesy call on Rajya Sabha chairman M Venkaiah Naidu last week, he had a suggestion to make: extend the duration of the Question Hour and Zero Hour. Question Hour is the slot in which members of Parliament seek replies from the government on subjects related to various ministries. Zero Hour is when members bring substantive issues to the attention of the House. 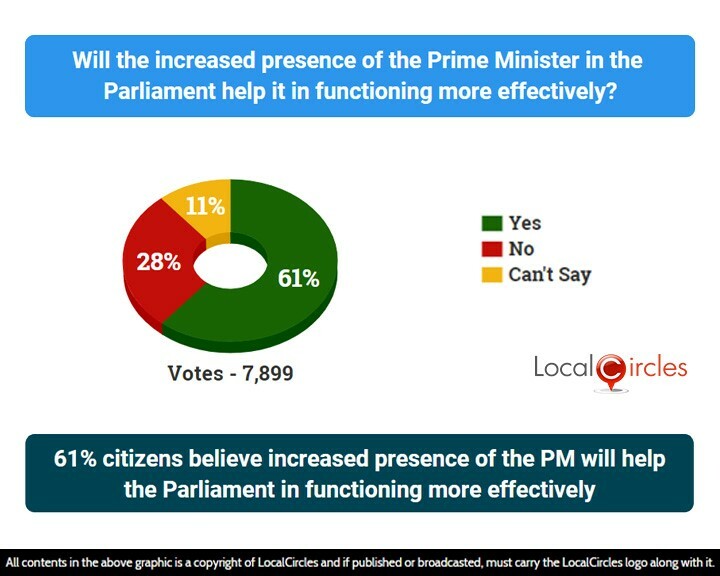 The next poll showed that 61% citizens believe increased presence of the PM will help the parliament in functioning more effectively. Only 28% thought it will not help where as 11% were unsure about it. Recently, the High Court dismissed a petition by MP Sanjay Singh, which sought direction to the Lok Sabha Speaker to take appropriate steps to ensure presence of all the MPs including the Prime Minister at least 75 per cent of the sittings. 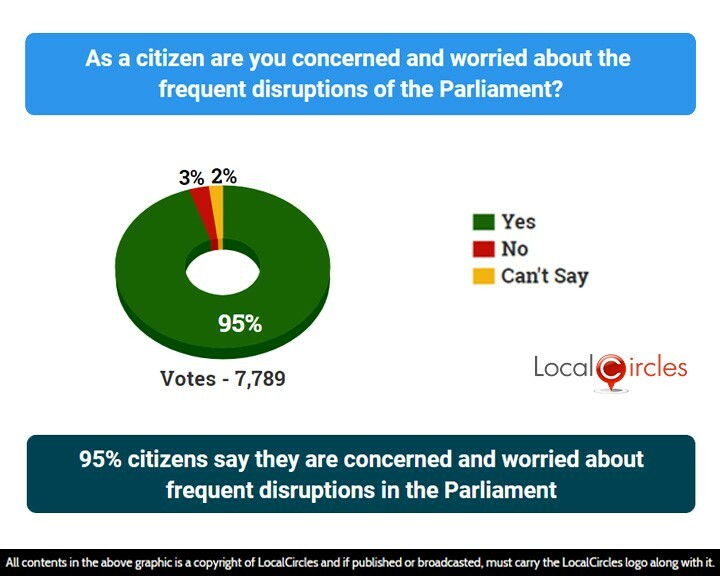 When asked if as citizens people were concerned and worried about the frequent disruptions of the parliament, 95% said yes while only 3% said no. 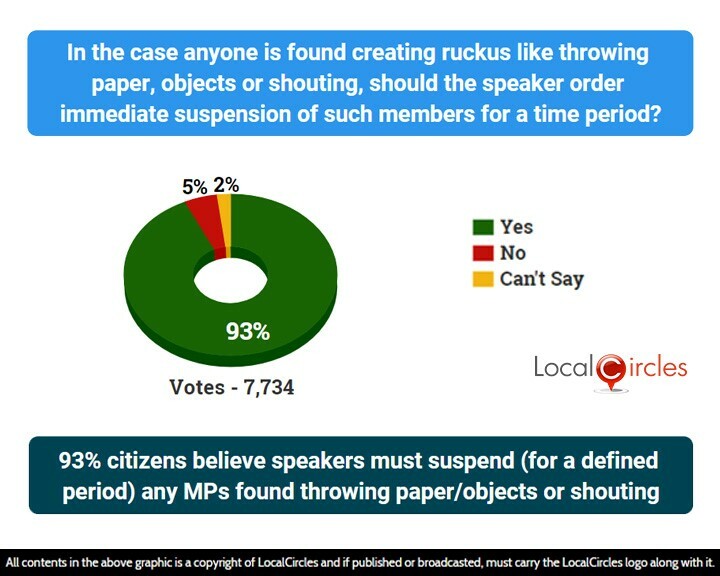 Another issue that regularly happens is the Parliament is the creation of ruckus like throwing paper, objects or shouting, should the speaker order immediate suspension of such members for a time period? 93% respondents agreed with it while a meagre 5% did not agree with it. Last week, Lok Sabha speaker Sumitra Mahajan also sent a letter to all MPs asking them to allow the discussions and not disrupt the proceedings. She said it was the "moral duty" of every MP to ensure that the rules for the conduct of business in the House are not disrupted. The last question asked who is to be blamed for disruption and non-performance of the parliament in the last several sessions. 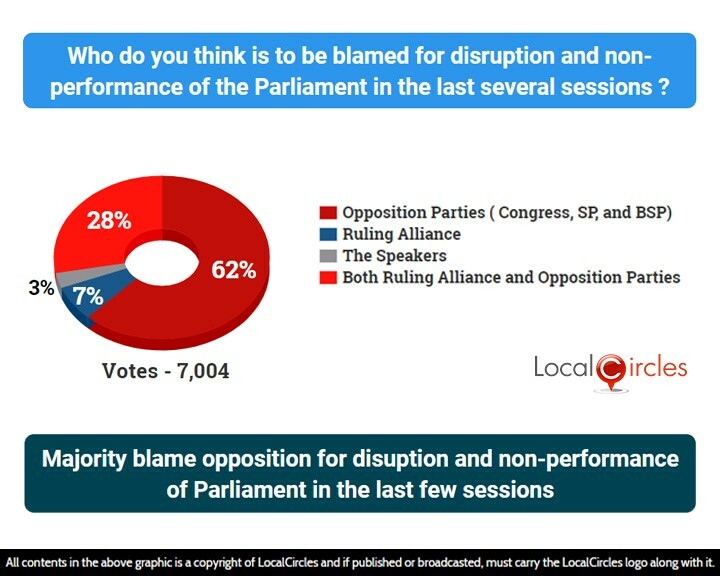 62% said it is the opposition parties (Congress, SP and BSP), 7% said Ruling Alliance, 3% said the Speaker and 28% said both Ruling Alliance and Opposition Parties. Salaries of MPs were increased four times in the last five years. Due to the face-off between the government and Opposition, there was hardly any business conducted during the last two sessions, both ending up as washouts. Citizens also came out with several suggestions to make sure that the parliament functions properly this time. This included MPs taking a pay cut if the Parliament does not function properly, minimum work being assigned for each day of the session, opposition being given a set time to put forward their thoughts etc. 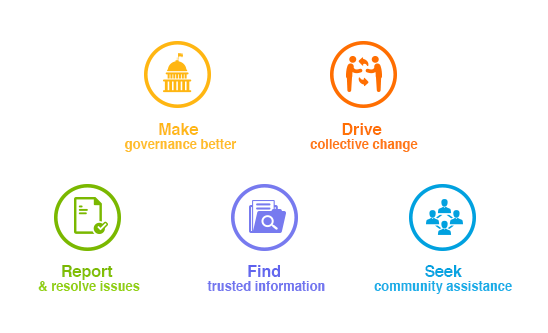 Over 53,000 responses were received from over 30,000 unique citizens located in 200+ districts of India. Approximately 32% of the respondents were women while 68% were men. 45% of the participants were from Metro/Tier 1 cities, 31% from Tier 2 cities and 24% were from Tier 3 and rural locations.